I’ve kinda been secretly working on an overhaul to my craft room. I know, crazy right? But I really needed something functional: lots of workspace and lots of storage. 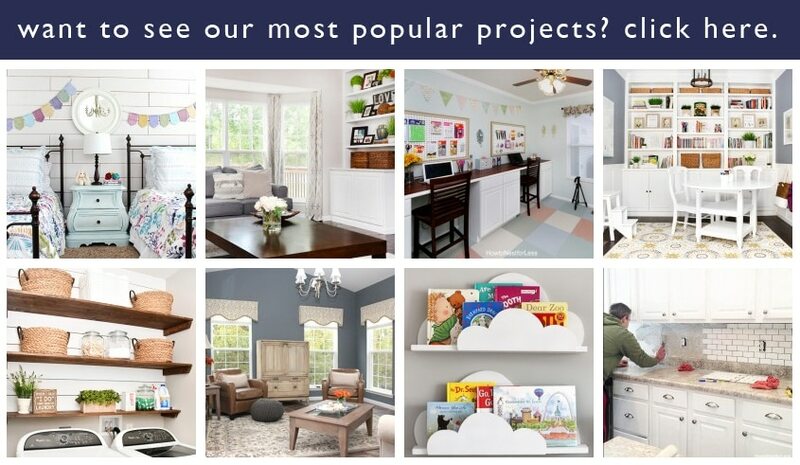 If you could add in a place for my kiddo to watch TV or play with her toys, or a place for my hubby to work on his laptop while I’m crafting… well, I’d probably be dreaming. But oh my, how dreams do come true! 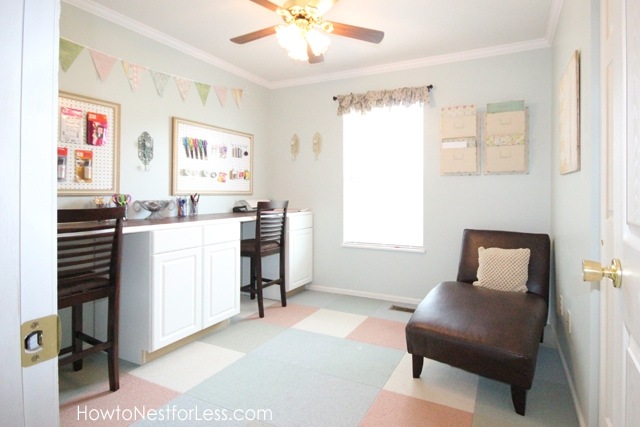 Come on, let’s take a tour of my new craft room/playroom/home office! Since this room is only 10×10 feet, I didn’t have much room to work with. The best solution for workspace? A 10 foot desk with cabinet storage, plus space for both me & my hubby to work! And I’m in LOVE with the new carpet tiles from Flor! I’m diggin’ the pattern and the use of color on the floor instead of the walls. And we actually installed the Flor tiles ourselves in just a couple of hours. Yep, super easy (and I’m giving a how-to tutorial tomorrow!). We purchased all of the materials for the desk from Lowe’s and Home Depot. The only thing we still need to do is add the toe kicks to the bottom of the cabinets. GET THE FULL DIY DESK TUTORIAL HERE. 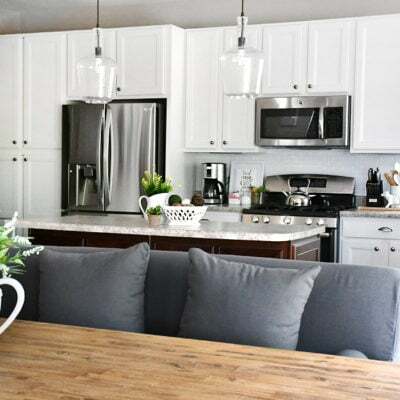 To contrast the white cabinets and lighter décor, we added a brown leather chaise and two expresso bar stools that are upholstered with brown microfiber. The best part of this room? ORGANIZATION! I’ve had the frames seen below stored in my basement for over SIX YEARS! Finally put them to good use by framing some peg board. Love the final result! I found this polka dot burlap material at Hancock Fabrics awhile back and was waiting for the perfect project to put it to good use. I just cut the material into strips and tied the pieces around the curtain rod… took less than 10 minutes! The bunting is just scrapbook paper and ribbon, and the doorknob hooks I’ve had for about a year and a half (previously purchased from Pier 1 Imports). This wall I left pretty much blank. I figure it’s a great place to stage photos for any new project. The chaise is a great place for my kiddo to kick back and tell me about her day or watch TV while I’m working. I could also see myself snuggling up with a good book here! And those hanging files on the wall behind it are filled with my scrapbook paper. LOVE it! And still plenty of space for my kiddo to play on the new floor! GET THE FULL DIY DESK TUTORIAL HERE. Thanks so much Janelle! It’s nice having two workspaces in one office! 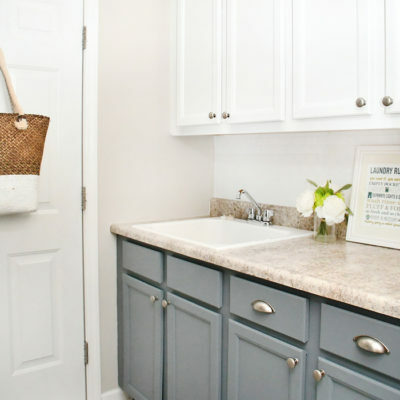 Your craft room is so clean and fresh looking! I love the floor covering and your cute idea for the window curtain! Now, how long does it take before it’s a crafter’s mess?!!! It’s still clean for now, but I have to admit the rest of my house is a HUGE MESS since I’ve been ignoring the piles of laundry and kitchen floor while trying to finish this room! If you’re ever in St. Louis, stop on by!! Thanks sweet pea 🙂 LOVE ya! I LOVE this! This makes me want to makeover my office! SO Jealous! What a great space! 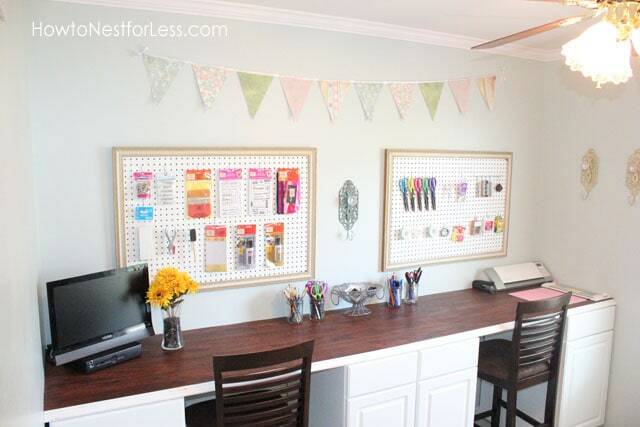 You’re making me want to sell my spare bedroom furniture and just make that my craft room instead. Can’t get enough of those floor tiles. They look fab! What’s the floor like underneath? That looks awesome, Erin! Love that bunting, and the color is perfection. So happy! You did a great job! Absolutely beautiful! What a stunning space!! Looks fantastic! I am quite jealous…I want your dream to come true for me too…lol! Great job Erin!! The built in cabinets are amazing!! Wow! Erin it looks so great! Love how bright it feels because of the color palette you chose. Great job! I love your space. I love that it is uncluttered and so well organized. It seems like you have a lot of great storage space. I love the colors you choose for the room as well! That cannot be the same yellow room as before! It looks AWESOME Erin! I love the desk/workspace! It is just gorgeous! Fabulous job.. 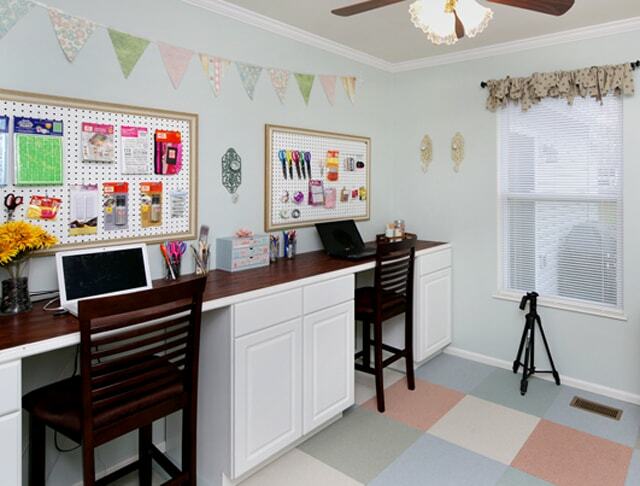 I love how your craft room turned out! I think the desk is a super way to get the most use out of your space! What color did you use on the walls? I love how cool and bright it looks! Thanks so much Hilary! The paint on the walls is Sea Salt by Sherwinn Williams. I actually just painted my kitchen the same color since I’m so in love with it! Oh, goodness…I love it!!! It’s beautiful, organized, and peaceful. What a wonderful, inspiring place to create. My room that I want as a craft room is small (9 X 10) and I hope it turns out as well. Yours is beautiful and well organized. Thanks for sharing. Thanks Shirley! It’s tough designing for small spaces. Hope my room design helps you! What a beautiful job! I have a spare bedroom thats about the same size that I want to turn into an office/crafting space. You’ve given me some great ideas. Oh, I’ll definitely post some pics! And you should see the rest of my house right now. I think a tornado ran through it this past week (about 7 different times). Erin, it’s beautiful!! I love that you incorporated a space for hubby! 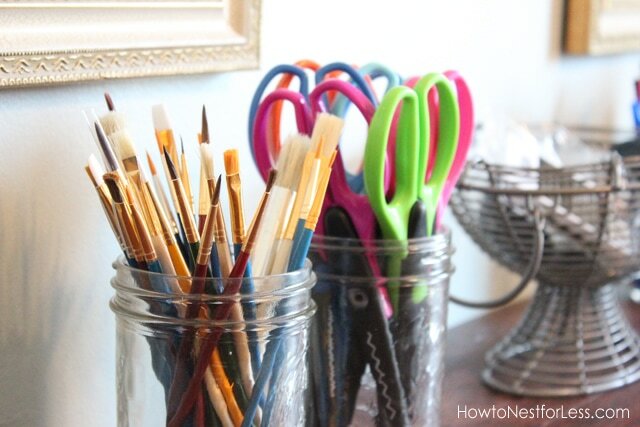 That’s what I want to do when I get my craft room done…..mine is still just a dream in my head, but it’s coming! You did a wonderful job. 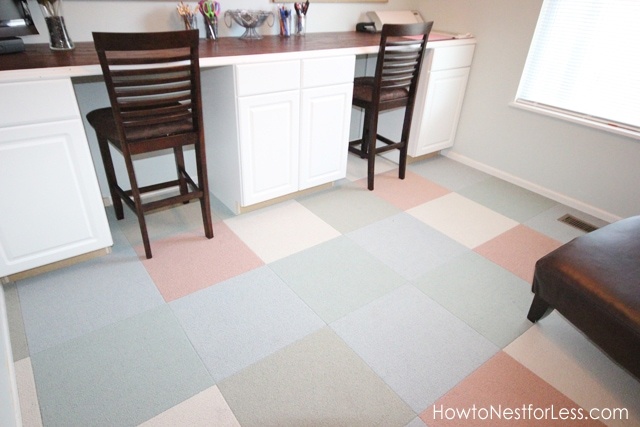 I love the color carpet tile – what a great idea! Thanks so much for sharing! Thanks so much. I love organization too, Linda! I’m definitely at peace if everything has a place! Wow! Super envious here…I love how organized everything is. 🙂 Can’t wait to meet you at Haven this week! THanks so much Amanda! We’ll be hanging out in less than 48 hours, whoo hoo!! It looks great! So nice for you to have an dedicated workspace! My handyman and I have made side by side workstations in the past, a couple of times -once in our bedroom closet while living in a tiny apartment. Thanks Laura! Very cool that you guys have done this type of desk in the past. I’m totally diggin’ it so far! Thanks Erin! I got the wall pockets from TJ Maxx!! They were actually the last thing I added to the craft room and I just LOVE them! Wow. This is gorgeous!! It looks ah-mazing!!! Seriously. I had to pin it for my own craft room inspiration. Fabulous job, Erin. Hope you are enjoying it. You’re so sweet, Victoria. Thanks so much!! I’m enjoying every minute in there! I love it! I have a couple of places in my house that would work for a project like this. I am inspired to start something now! I work full-time outside the house, sell Thirty-One on the side, have four busy kids AND try to craft whenever I get the chance. To have someplace where I could take care of 3 our of 4 things would be so wonderful! Maybe someday I will be posting pictures of my craft room. 🙂 Thanks for the great ideas and enjoy your room! You should!! It’s a great place for the entire family to gather and do activities! Love it! The double desk is a great idea and works the best in the small space. I have a room the same size and it’s given me some great ideas. It’s gorgeous!! I love the delicate colors you used. That flooring is awesome! 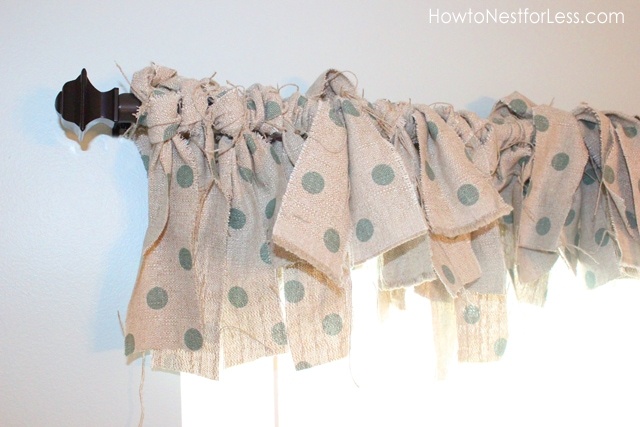 And love the scrappy pieces you’re using on the curtain rod. Really great idea! Thanks for sharing with us! What an inspiring room to work in – Fantastic job – thanks for sharing. . .
I’m so jealous! It looks great! It was great seeing you at Haven! Looks great! I need to get in gear and start working on mine. Thanks for the inspiration! I am feeling up for a craft day at your place. The room looks wonderful! I love the dual workspace. No fighting over who gets to work first. The flor tiles are great. The whole room looks good. Great job! Looks great! I’m working on my office/craftroom now so I love seeing what others do to their rooms. Love the framed peg board idea. Thanks so much Debra. Good luck with your space! 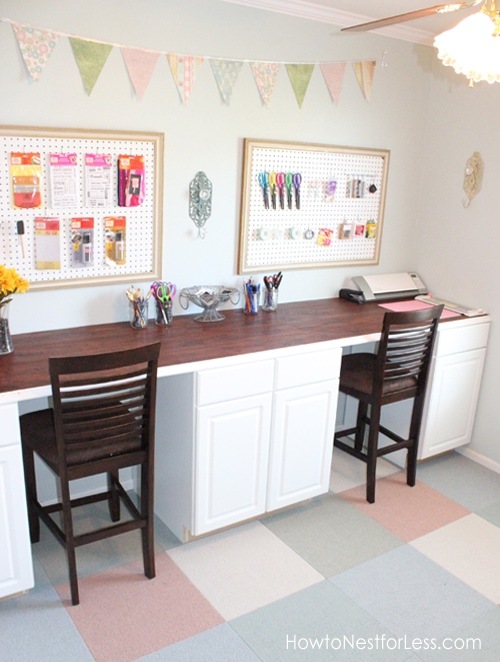 I adore everything about your craft room! It is gorgeous… awesome color pallet! just so pretty! would love for you to come share at the Hearts&Homes link party at mercy(INK)! It looks like a fun AND relaxing space. Awesome job! What a wonderful space you have created! I LOVE the desk for two! Your room is so fresh and inviting looking! The perfect room to craft in or just relax!!! THanks Jocelyn! I’m lovin’ it so far!! There is so much I adore about this room! The creative use of space makes this room look MUCH larger than 10 x 10 feet! The long desktop is wonderful, the chaise lounge is a great idea, the valance is to die for….and the flooring is so pretty. All in all? You’ve created an inspiring room to create. Congrats!! I want to come create there–someday I will have a beautiful space like this…someday! Thanks for linking up. Come on over, Becky!! I’d LOVE to have you! This is so fresh and delightful, What a gorgeous room! ps- i just noticed- i love how it matches your blog colors!!! LOL, I never noticed the colors match! I’m actually ending my linky party, but I’ll add your party to my list. Thanks again! My Mom asked me to “re-do” her workroom for her as her birthday gift (I was flattered) and I appreciate all the inspiration your room has given me as I get ready to start her overhaul! So nice that you gave yourself such great space to “create” in. I love this! You did an amazing job! And that burlap window treatment is such a cool idea! Way to go! Wow! This is an amazing room! So inspiring! Beautiful! I love the desk! What a great place to create! 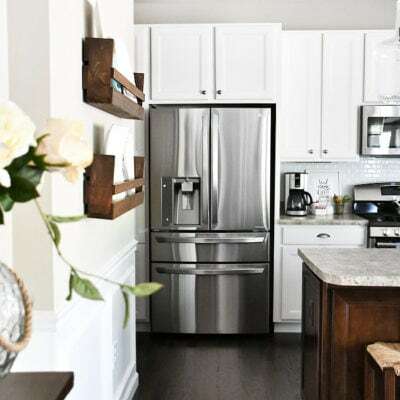 Love the white with the dark accents (that countertop is beautiful). I love Flor tiles – you picked winners! Love that curtain rod – so cute! This space reminds me of the office in John an Sherry’s house over at Young House Love! I love it! Can’t wait for the tutorial on the desk. 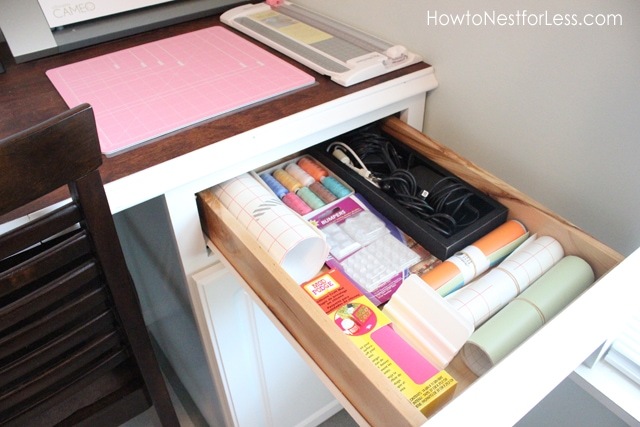 I have been searching the web for a solution to my very small craft room and this is PERFECt!! thanks for the reveal and I will be watching for the tute!! This is a fantastic makeover! Would you consider linking this up at my Pinworthy Projects Party? I hope to see you there! So beautiful! What an amazing place to create in. I don’t know how I missed this… so glad I caught it though. Super pretty!! WOW! I LOVE THIS! Everything is so neat and organized and the color on the walls make everything look bright and clean. Great job!! I love how your room turned out!!!! I am visiting from the Tater tots and Jello link up and thought I would stop by and say hi. I am a new follower! Hope you will stop by http://www.garagesalesrus.blogspot.com/ and do the same. Thank you for linking up to The Mommy Club last week. This post was the #4 most clicked link last week! Congrats and thank you for sharing with us. Stop on in and see your feature. I hope you share more of your wonderful ideas with us! Great room, Erin! The carpet tiles are a wonderful idea, & so sharp-looking to frame the pegboard. I think you are very smart to have counter-height workspace — nice to be able to sit if you want, but there are always things that just work better when you’re standing. I have a counter-height island in my space & use it often. It was fun seeing your space! THanks Jennifer! I purchased the cabinets from Lowe’s and made the desktop out of plywood. Then we covered it with laminate flooring! I finished the edges off with some trim and that’s it! Oh Erin!! This is so beautiful! You’ve done such a great job! What a pretty and relaxing and calm space to create. I love it!! Gorgeous! I am so happy for. I hope you have many happy hours of crafting joy in here. IN love with your room, I want one! My craft room/office is a train wreck. Love the polka dot burlap. Great job!!! There are so many things i love about this space. 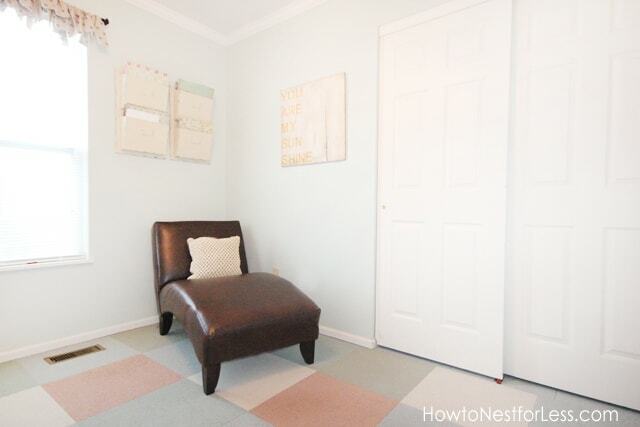 The floor tiles are amazing, and I love the hanging file storage on the wall for scrapbook paper. I feel the need to steal that idea. Where did you find your file storage? Love your use of stools at your desks. We have some built-in shelving in our house, and the countertops are too high for regular chairs. Now, I must find some great stools to put there. And I love that fabric from Hancock. Pinning that and hoping I can find it locally. Thanks AMy! I found the wall files from TJ Maxx, along with the stools at my desk. One stop shopping!! Oh, I am soooooo in love with this. A girl can dream . . . You did an amazing job!! I love your craft room, I am moving house soon and my craft room will be very small, some good ideas here for me. Thank you! Thanks so much! Good luck with your new space! Love the room … quite a transformation! One question … where did the sewing machine go? HAHA!! It’s in the basement right now. I’m debating whether to put it back or not. I still haven’t learned to sew. Still on my bucket list! What a great room! Your desk is fabulous and the space looks inspiring! 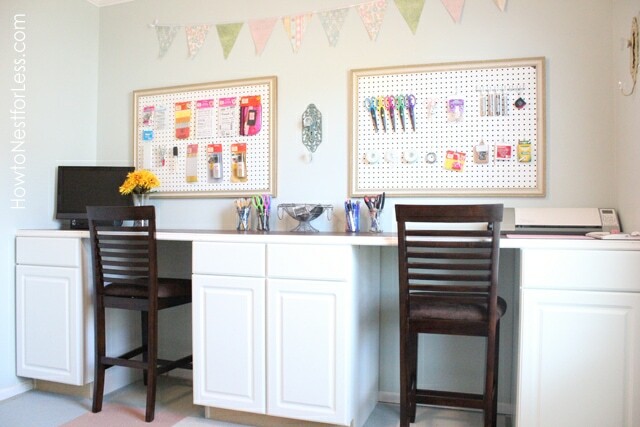 I love the peg boards in your craft room. Perfect size!! Where did you purchase them? Thanks!! ENVIOUS. my craft room is a big junk nightmare. I need to EDIT. I love your peg boards. did you have the store cut them down for you? Thanks so much! And yes, Lowe’s will trim the peg boards down for free! what is the paint color you used. i love it! Sea Salt by Sherwin Williams! 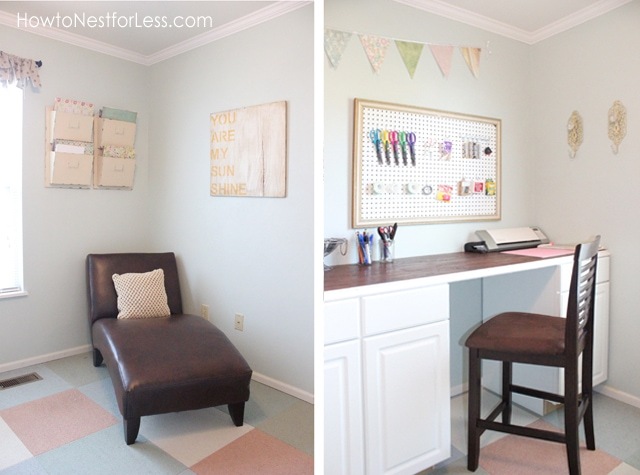 It’s all beautiful, and I love the framed pegboard idea! 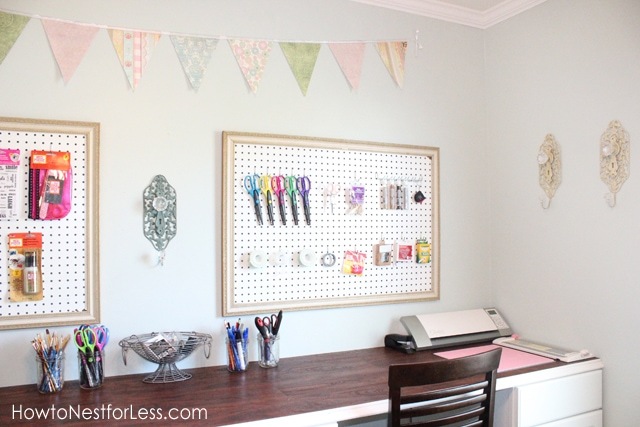 I have some pegboard in my garage and I think I’m going to do that next week! Is that one large piece of wood for the top of the desk? Or did you have to put two together? If it is, what is it exactly (dimensions and type)? This would be great for our homeschool room (which is also a 10×10). We pieced together pieces of plywood and then covered the entire thing in laminate flooring for a finished look. 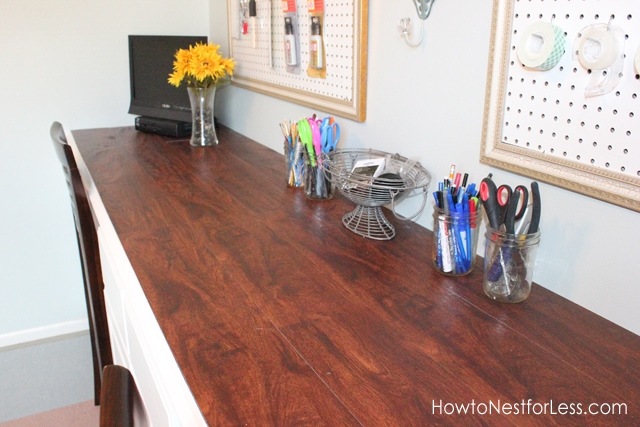 I love the idea of laminate flooring for a desk surface. But I’m wondering what you did for that nice white edge-banding. In other words, what is concealing the front edges of the plywood and flooring “sandwich”? Also, what is the plywood thickness? Thanks for your inspiration! We used quarter round molding along the edges to “hide” the plywood and flooring edges. Just used some finishing nails to fasten. We also used 3/4 inch plywood. You can find the entire tutorial for the desk here. Is the height that you need for your desk barstool height? Also, after living with your desk at this height for a while, do you like the height it is, or would you rather it be standard desk height? I’m looking to build one of these this next week so I’m just trying to figure out if I’d like the height the base cabinets come in (or if I should chop the bases off to make them standard desk height). I’d love your opinion! Yes, the standard cabinets make the desk barstool height. I actually prefer this since I tend to stand/sit when working on projects! Actually… I think I mostly stand 🙂 I’d do it again in a heartbeat! Beautiful! 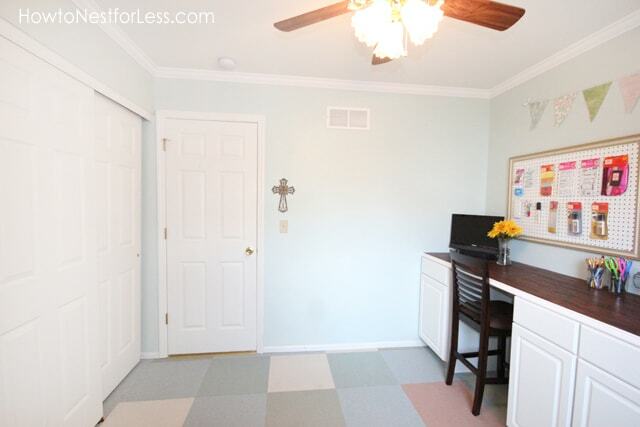 I recently redid my room to look similar to this one, but am having trouble with power cords — did you drill holes behind your computer, etc, or is your countertop not flush with the wall? This is wonderful and exactly what I need in my kid’s playroom. Did you use standard cabinets from the home supply store? Can you provide a few more details on where you got the materials? 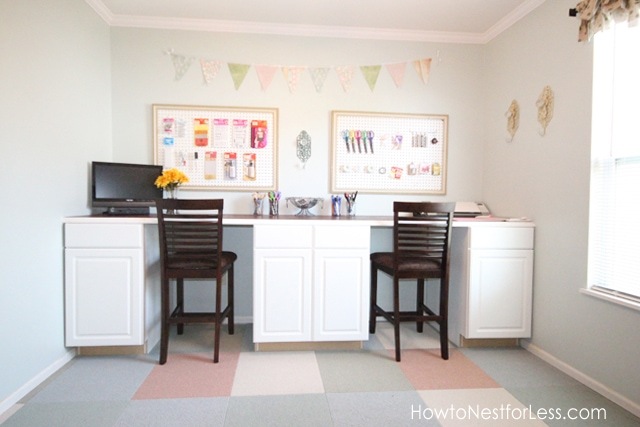 Thanks for posting, again, this is exactly what I need for my two kids (girl 5 and boy 10) to have their own workspace in the bonus room! I am sooooo doing this. Right now I am using tables but I sure do miss drawers and hiding spaces for everything!!! 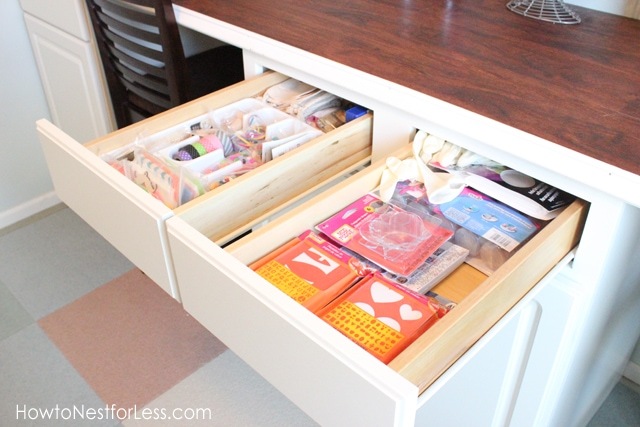 Drawers are amazingly awesome for organization! 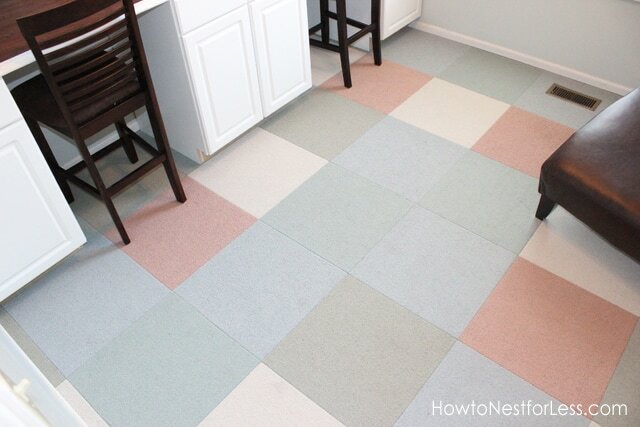 Did you use carpet tiles for the floor? If so, where did you purchase them? Yes, we used Flor carpet tiles. I would highly recommend them. We purchased them online! I have two framed pegboard in my craft/sewing room. We used wider moulding and paonted them turqoise. What size hooks did you use? I have xS” hooks but they’re too big for the pegboard holes.love your space. I’m looking for a small flat screen TV for in mine. I need to watch my HGTV.